LEANTRO #6 is up on Ulises Farinas’s Orgo’s Books of Knowledge !! LEANTRO takes place in the same wintry world as the original MOTRO web-comic by Ulises on act-i-vate. I was hugely inspired in general by this web comic. Leantro and Motro are both stocky people with three toes on each foot. The sketch below on the left is what Ulises drew for me to understand the size and strength of Leantro’s people. She’s standing next to a ten-toed human man (the kind we’re used to). The panel on the right is from the original MOTRO webcomic. MOTRO was a huge inspiration for the feeling of Leantro’s story, and just an influence on how I want to tell stories in general. His voice got choked in a sob and then he flew at her. She caught his arms in mid-air and he twisted himself like a fish in her grasp. He was not a very good fighter. He got a few kicks in and seemed to be trying to climb her like a tree. at Orgo’s Books of Knowledge, updates Mondays! 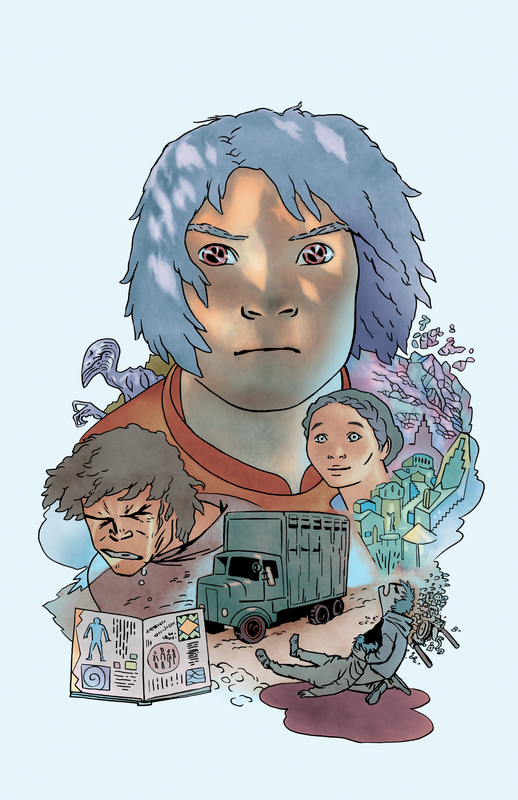 tales from the MOTRO universe, brain child of wunderkind Ulises Farinas! He was almost as tall as her sisters, but not as thick. He was a different kind of person—she could see from how close his facial bones were to his skin that he was a ten-toed person. He was bundled in layers of clothing that would have suffocated Leantro. She wondered how many weapons could be hidden in all that cloth, and thought about how fast she could get to her own knife. When she took a few steps back toward the truck, her fear died down to a lonely ache. She stopped and looked up at the few stars showing through the high overcast. Solitude had always been an escape. It had been cool and delicious, and never lasted as long as she wanted it to. Loneliness was new. It’s up at Orgo’s Books of Knowledge! Written by me, created and influenced by the mind of Ulises Farinas! Read the third installment of our Leantro’s brave tale. Instead of being afraid, she was like a moon waxed to fullness and she ran her hand along the truck’s side to the door handle. She sat in the old driver’s seat like it was the cockpit of a craft that could take her to the stars. She let the steering wheel flow through her loose grip. Everything felt different to her fingertips. Everything had a crispness to it that was almost like feeling beautiful. I’m writing a serialized adventure novel called Leantro, and it is nestled within a new web-comic anthology called Orgo’s Books of Knowledge. Ulises Farinas is the mastermind of this project, and he’s working with a bunch of different artists to make stories that all take place in the same world. It feels like we are all like little kids having so much fun with this project, so I hope you check it out as we get it off the ground.